Heading around the corner from Mayor Street toward Bailén Street and walking in the direction of Plaza de Espana, we pass the Almudena Cathedral on our left. Further ahead is the Royal Palace of Madrid, also known as the Palacio de Oriente. To the right are the Palace are its gardens and the statue of Felipe IV. I sincerely believe this to be one of the most beautiful buildings here in Spain, as well as the most beautiful palace in all of Europe, and possibly the world! Here’s a little information from the 16th century. The Muslim kings from Toledo built a defensive fortress that was later occupied by the Christian kings until the 16th century, when they constructed a palace. The Spanish monarchs lived there until the 18th century when, on Christmas Eve of 1734, it was destroyed by a fire. Every Wednesday at 11 in the morning from January to June, four members of the Spanish Royal Guard, two on feet and two on horseback, carry out the changing of the guard in front of the Royal Palace of Madrid’s Puerta de Principe gate. They dress in uniforms similar to those worn by the Spanish army during Alfonso XIII’s reign. They’re accompanied by a fife and a drum. The horseman stand still with the lances and every 15 minutes they move in front of the Royal Palace’s façade. In total, 27 guards and six horses participate in the ceremony. Each change lasts seven minutes and take place every half hour for the foot soldiers and every hour for the mounted soldiers, until 2 PM. 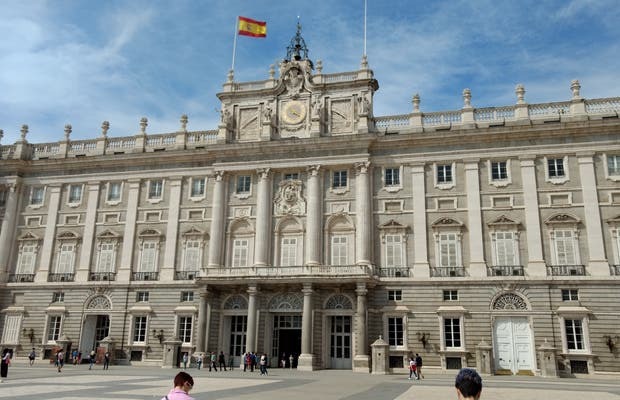 The Royal Palace of Madrid is full of history. Getting closer is already something interesting. Its presence is overwhelming. The white color imposes, as well as the location. Right in the center of Madrid, with great views on Casa de Campo. Without a doubt one of the most beautiful palaces in Europe, usually unknown by the locals themselves. Surrounded by lovely gardens and with a surprising historical importance, the visit is a must and grateful to the many tourists coming to the capital city. I absolutely recommend this place.